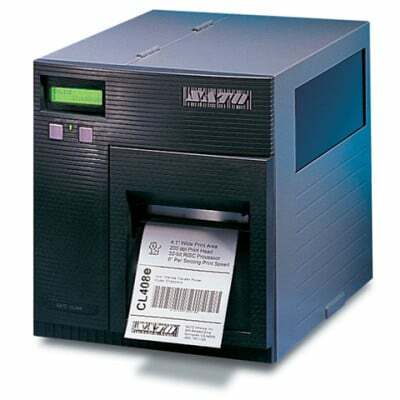 SATO CL408e RFID RFID Printer - Big Sales, Big Inventory and Same Day Shipping! High-Performance, High-Value Printers For advanced technology and high-speed performance, the CLe Series printers have no match in the industry. Built in the tradition of SATO's rugged dependability, the CLe Series printers are based on RISC processors, delivering high-quality images at high speeds. 2.5" x 1.5" Thermal transfer paper label and ribbon pack. 1360 labels/roll, 8 roll case. Includes 4 wax ribbon. 3" x 5" Thermal transfer paper label and ribbon pack. 480 labels/roll, 4 roll case. Includes 2 wax ribbon. 4" x 4" Thermal transfer paper label and ribbon pack. 530 labels/roll, 4 roll case. Includes 2 wax ribbon. T101A STANDARD (GENERAL PURPOSE WAX) RIBBONS FOR SATO/ARGOX INDUSTRIAL PRINTERS, 4.17" x 1,345', 24 roll case. Also available as a single roll (Part# 12S000165-R). T101A STANDARD (GENERAL PURPOSE WAX) RIBBONS FOR SATO/ARGOX INDUSTRIAL PRINTERS, 2.52" x 1,345', 24 roll case. Also available as a single roll (Part# 12S000163-R). T113L, HIGH PREFORMANCE WAX FOR ALL ARGOX CP-2140 PRINTERS, 2.36" x 984', 24 roll case. Also available as a single roll (Part# 12S000356-R). Service Contract - 2 year, New Equipment, On-site Standard (2 business days). Service Contract - 1 year, New Equipment, On-site Next Business Day. Service Contract - 2 year, Extended Warranty CL408 without Printhead Coverage. Service Contract - 2 year, New Equipment, On-site Next Business Day.